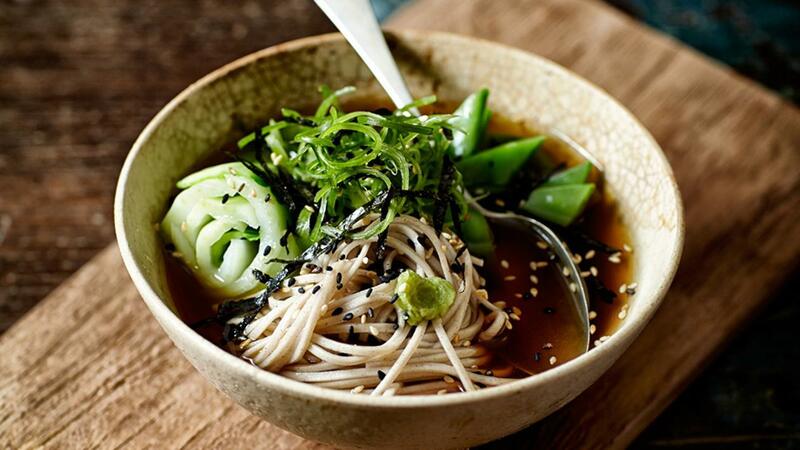 Soba noodles are made of buckwheat and known for their unique, chewy texture. This noodle soup is a quick and healthy, but filling and satisfying with an umami flavoured broth. Bring the beef stock to a boil and add the bonito flakes. Let simmer and pass through a sieve. Cook the soba noodles in about 6 minutes until just tender. Finely slice the green part of the spring onions and keep aside in ice water. Clean the rest of the spring onions and cut in little rings. Clean the snow peas, cut in little diamond shapes and blanch briefly. Twirl the noodles around a fork making a roll and put them in bowls. Divide bok choy, snow peas and spring onions over the bowls and pour in the hot broth. Finish the dish with wakame, sesame seeds and julienne of nori leaves. Serve with wasabi paste.